Le label Sony Music informe dans un courriel que le nouvel album d’AMON AMARTH s’intitule Jomsviking. Sa tracklist est visible ci-dessous mais sa date de sortie n’est pas encore connue. Le disque pourrait toutefois voir le jour au printemps prochain. Ah ouais, ils ont carrément signé chez Sony ! Pas encore de news sur l'identité du batteur par contre. Des vikings, tiens donc, comme c'est original! Swedish death metallers AMON AMARTH have released a humorous teaser video for their upcoming single, "First Kill". The three-minute clip, dubbed "Keyboard Warrior", can be seen below. "First Kill" will be the first single/video from AMON AMARTH's forthcoming tenth studio album, due later in the year via Metal Blade. C'est un peu les AC/DC du Death Mélodique j'imagine. C'est ça, c'est toujours pareil mais c'est toujours aussi bon. D'après Metal Archives me batteur serait Tobias "Tobben" Gustafsson (Cut Up, God Macabre, ex-Eureka, ex-God Among Insects, ex-Syrus, ex-Torture Division, ex-Vomitory, ex-The Project Hate MCMXCIX, ex-Timothy Griffiths' Psychedelic Sunrise, ex-Bay Laurel). On March 25, Swedish metal kings AMON AMARTH will unleash their tenth studio album, "Jomsviking", via Metal Blade in North America and Sony Music internationally. 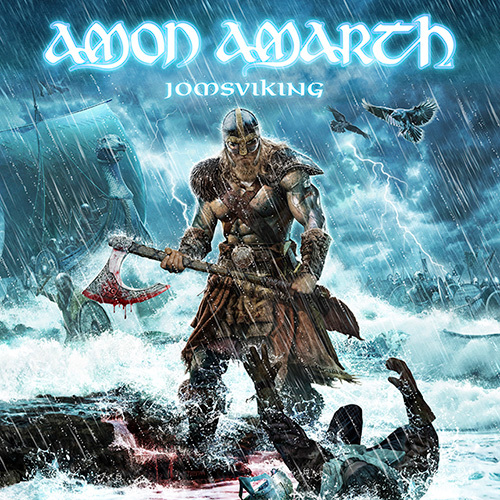 "Jomsviking" — the first concept record in AMON AMARTH's storied career — tells a tragic tale of love and revenge, backed by the Swedes' trademark melodic, anthemic metal, which was produced and mixed once again by Andy Sneap (MEGADETH, TESTAMENT, ACCEPT) and also features special guest session drummer Tobias Gustafsson (VOMITORY). The epic original story is set in the world of the Jomsvikings, the legendary order of mercenary Vikings. AMON AMARTH frontman Johan Hegg explains: "The Jomsvikings were a shadowy and legendary sect of Viking mercenaries, as shrouded in myth now as they were when they fought across Europe and the Middle East. Ruthless and deadly warriors who fought for the highest bidder, their code was simple: Show no fear. Never retreat. Defend your brothers, and when called upon, avenge their deaths." He continues: "I felt we were finally ready to use their story as the jumping off point for an AMON AMARTH album. The Jomsvikings and their world is the background for the story of a young man that is in love with a girl but unfortunately she's being married off. He accidentally kills a man when this happens and he has to flee — but he swears to have revenge and win her back. He can't let go of the past. He feels that he's been wronged and his life has been destroyed. The way the story evolves is not a happy story." By far AMON AMARTH's most ambitious project to date, "Jomsviking" is available for pre-order in various formats now at AmonAmarth.com, where fans can also view the video for the album's first single, "First Kill". Produced by Grupa 13 and directed by Darek Szermanowicz (BEHEMOTH), "First Kill" was filmed in Gohrweide (Germany) and Warsaw (Poland) and features a cinematic depiction of the violent, brutal lyrics, along with powerful live footage of the band performing with their full dragon head and pyro stage set. Adds Hegg: "'Deceiver Of The Gods' was very successful for us and we had a good run with that and did some really great tours. Even before we changed drummers for this record we had the idea to make a concept album. It was something we'd never done before and it gave us a challenge. I started writing the story, went into it wholeheartedly and once you start going down that path there's really no turning back." Et ils sont en concert à Paris le mercredi 23/03/2016 à 19h30 au Divan du Monde. On ne risque pas de voir le drakkar ! Par contre vu la salle ça pourrait être assez incroyable ! Dites, je l'aime bien ce titre ! Ce serait quoi l'album déjà sorti qui s'en rapproche le plus (et celui qui dit tous a le droit à ma plus haute considération). C'est bien épique et puissant tout ça. Peut être Twilight Of The Thunder God. Leur discographie est assez homogène en fait. Pour moi, Twilight Of The Thunder God est quand même leur meilleur album! Un peu devant Versus The World et Fate Of Norns! Essaie un de ces trois-là, Dickie, tu sauras à ce moment là! Je conseillerais plutôt With Oden on our Side que Fate of Norns, je pense. Johan: "Actually, Tobias, he's an old friend of the band, and we instantly contacted him to make the album with us, because we knew he's a very positive guy and has great, creative ideas. We wanted to have somebody we knew very well when we wrote the album. Because it would have felt strange to start to write an album with somebody we never met before. He was only in the band for the making of the album. Now we're actually looking for a new drummer that's gonna be a permanent solution for the touring season. We have one guy we're trying at the moment that's gonna start the touring cycle, and then we will see if he has the potential to grow into the band on a personal level." Johan: "Because this story has a very prominent character in the shape of a woman, so it felt… When he goes back in the story to try to win her back. We felt like that part of the story needed to have also female vocals. And then we started to think who could fit… which voice would into our style of music, and pretty much instantly we were thinking about Doro, since she has [a lot of character and a] heavy metal-sounding voice." Ah oui, tiens, je l'avais oublié celui-là! Moi aussi ! Mais il faut reconnaitre que c'est pas le meilleur pour découvrir le groupe. Il y a de très bons titres dedans, notamment An Ancient Sign Of Coming Storm, Fate Of Norns et Once Sealed In Blood. Ok, quelques titres moins bons, mais c'est assez représentatif de l'ensemble de leurs albums, non? Avec le recul je le trouve un peu inégal, moins ultime que Vs the World et moins accrocheur que les suivants. S1phonique a écrit: Au divan !! C'est bien sur déja complet (pas étonnant vu la taille de la salle). Bon beh l'album tabasse des mémés et brûlent des villages en bord de Meuse. Ca c'est dit. Leur meilleur album ? Celui de la maturité ? Un best of de leur carrière ? Bah c'est du Amon Amarth, c'est balisé à crever, t'es pas surprise et t'en as pour ton argent. Niveau qualité de son, le streaming était à dégueuler, mais je doute que le résultat final soit mauvais. Niveau compos, ça sonne bien, y'a des moments "je bombe le torse, chuis un Viking, agrougrou", perso je demande pas plus.